On November 10, 2018, about 0752 Pacific standard time, an experimental amateur built Vans RV-7A airplane, N5433T, was destroyed during a forced landing following a loss of engine power during takeoff from Ramona Airport, Ramona, California. The private pilot and pilot rated passenger were not injured. The airplane was registered to private individuals and operated by the pilot under the provisions of Title 14 Code of Federal Regulations Part 91 as a personal flight. Visual meteorological conditions prevailed, and no flight plan was filed for the local flight, which was originating at the time of the accident. The pilot and passenger reported that the airplane had recently been constructed and the accident flight was the first flight. Following an uneventful engine runup, the pilot applied full power to initiate a takeoff. As the airplane crossed the departure end of runway 27, about 500 ft above ground level, the engine began to lose power. Despite the pilot's attempts, he was unable to restore engine power and initiated a forced landing in an open dirt field. During the landing roll, the right main landing gear struck a rock and separated. The airplane came to rest upright; however, a postimpact fire ensued, which consumed the inboard sections of both wings and the fuselage. The airplane was recovered to a secure location for further examination. A small plane crashed near the Ramona Airport in San Diego County Saturday morning after the pilot reported losing power to the aircraft, officials confirmed. The San Diego County Sheriff's Department said the aircraft went down just after 7:50 a.m. in a field off Rangeland and Highland roads, about 200 feet off the roadway, just west of the airport. Cal Fire officials said flames engulfed the plane following the crash. Firefighters were able to quickly knock down the fire on the plane, preventing the flames from spreading to surrounding brush in the field. Cal Fire and the California Highway Patrol confirmed two people inside the plane escaped the crash uninjured. 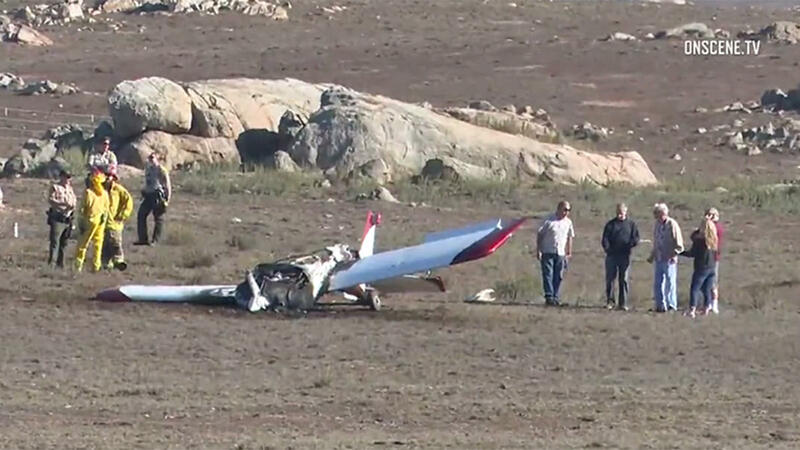 Federal Aviation Administration (FAA) spokesperson Allen Kenitzer told NBC 7 the aircraft was a Vans RV-7A. He said the pilot reported the plane lost power shortly after departing from the airport. The aircraft sustained substantial damage, Kenitzer said. The crash will be further investigated by the FAA and the National Transportation Safety Board. Ramona resident Nikki Bridges witnessed the aftermath as the aircraft went up in flames. At that point, Bridges said she couldn’t tell that a plane was being consumed by the fire. Rather, she thought it was a brush fire that, under current dry conditions, might quickly spread. Bridges immediately thought that, if this was a brush fire, she and her pets – including cats, a dog, two pigs, five horses and a donkey – would have to evacuate. “I’m just so relieved that the passengers are safe and relieved that we didn’t have to scramble [to evacuate],” she added. The Ramona Airport is located along Montecito Road, about two miles west of Ramona’s central business district.